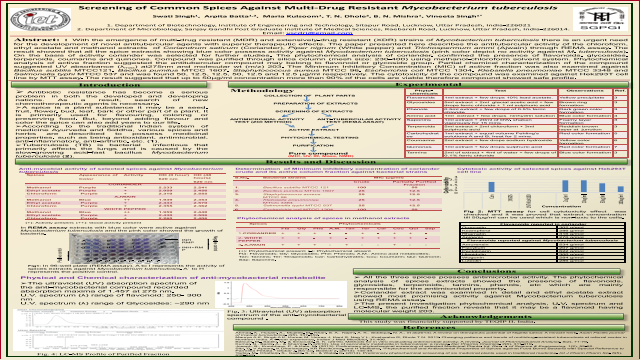 This poster was presented at International Conference on International Conference on Functional Biology and Molecular Interactions: Applications in Health and Agriculture (FBMI-2017), December 20 – 22, 2017. Abstract: With the emergence of multi-drug resistant (MDR) and extensively-drug resistant (XDR) strains of Mycobacterium tuberculosis there is an urgent need for the development of novel antitubercular agents with superior therapeutic effects. The paper presented here describes the antitubercular activity of the chloroform, ethyl acetate and methanol extracts of Coriandrum sativum (Coriander), Piper nigrum (White pepper) and Trichospermum ammi (Ajwain) through REMA assay. The result showed that all the spice extracts showing blue color possess activity against Mycobacterium tuberculosis (pink color depict no activity against M. tuberculosis). On the basis of activity coriander was selected for further studies. The phytochemical analysis of coriander, confirmed the presence of flavonoids, glycosides, terpenoids, coumarins and quinones. Compound was purified through silica column (mesh size: 230-400) using methanol-chloroform solvent system. Phytochemical analysis of active fraction suggested the antitubercular compound may belong to flavonoid or glycoside group. Partial chemical characterization of the compound suggested UV absorbance (λmax) at275nm and molecular wt (m/z) 203. The Minimum Inhibitory Concentration (MIC) of active fraction was also examined against Bacillus subtilis MTCC121, Bacillus pumilus MTCC 1607, Staphylococcus aureus MTCC 96, Escherichia coli MTCC 1304, Klebsiella pneumoniae MTCC 3348 and Salmonella typhi MTCC 537 and was found 50, 12.5, 12.5, 50, 12.5 and 12.5 μg/ml respectively. The cytotoxicity of the compound was examined against Hek293T cell line by MTT assay. The result suggested that up to 50μg/ml concentration more than 90% of the cells are viable therefore compound showed safe profile. Summary: Antibiotic resistance has become a serious problem in both the developed and developing nations. As a result, search of new chemotherapeutic agents is necessary. References: 1) Ahmad, A., Husain, A., Mujeeb, M., Khan, S. A., Najmi, A. K., Siddique, N. A., et al(2013). A review on therapeutic potential of Nigella sativa: A miracle herb. Asian Pacific journal of tropical biomedicine, 3(5), 337-352. 2) Maurya A K, Singh A K, Kumar M, Umrao J, Kant S, Nag V L, Kushwaha R, Dhole T N. 2013. Changing patterns and trends of multidrug-resistant tuberculosis at referral center in Northern India: A 4-year experience. Indian J Med Microbiol. 31:40­6. 3) Balouiri, M., Sadiki, M., & Ibnsouda, S. K. (2016). Methods for in vitro evaluating antimicrobial activity: A review. Journal of Pharmaceutical Analysis, 6(2), 71-79. 4) Kumar, N., Banik, A., & Sharma, P. (2010). Use of secondary metabolite in tuberculosis: a review. Der Pharma Chemica, 2(6), 311-319. 5) Joseph, B., Kumbhare, P., & Kale, M. (2013). Preliminary phytochemical screening of selected Medicinal Plants. Int. Res. J. of Science & Engineering, 1(2), 55-62.